304 pages | 35 B/W Illus. In recent years attention has switched from how adolescents are attracted into crime, to how adults reduce their offending and then stop – the process of desistance. There are now around a dozen major longitudinal and in-depth studies around the world which have followed or are following offenders over their life course, charting their offending history and their social and economic circumstances. 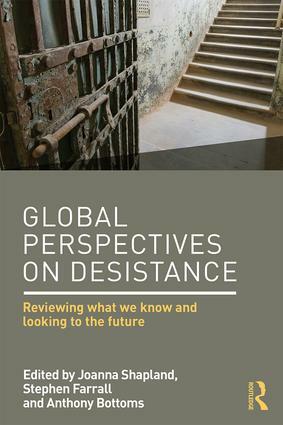 The book is the first to offer a global perspective on desistance and brings together international leading experts in the field from countries including the UK, Ireland, the Netherlands, Scandinavia, Spain, the USA, and Australia to set out what we know about desistance, and to advance our theoretical understanding. Drawing on leading studies, this book sets the academic agenda for future work on desistance and examines the implications and potential positive effects of this research on desistance processes among current offenders. Criminal justice and state interventions. Comprehensive and forward-thinking, this book is ideal for students studying criminology, probation and social work, social policy, sociology, and psychology. It is also essential reading for academic criminologists, sociologists, and policy makers and practitioners working in corrections and reform. "The study of desistance from crime has truly come of age with this impressive, international collection of some of the best research on the topic to date. Far from being the last word on desistance, the volume raises crucial, new questions for the next generation of studies in this fast-growing area." "Over the last 25 years, research on desistance from crime has burst on the criminological scene. Unfortunately, much of that research has focused solely on the U.S. This volume adds a much needed global perspective to the ongoing discussion. Drawing on empirical research from a wide range of countries, our knowledge of desistance from crime is expanded and enhanced. The section on criminal justice and state interventions in particular adds an important dimension to the desistance debate. While contentious issues remain unresolved, this book is a must read for researchers and policymakers interested in what it takes to move offenders away from crime." "This volume offers an impressive array of divergent perspectives on the process of desistance from crime, and successfully integrates these diverse outlooks into a coherent story. Drawing on an assortment of varied research methodologies and cultural settings, the authors take stock of the state of knowledge on desistance and provide a useful roadmap for future desistance research." "In this very rich and truly international (albeit with a strong European base) collection, classical desistance discussions (e.g. hooks for change, social capital, cognitive and narrative changes, etc.) are updated and extended both theoretically (notably by integrating developmental theories), and in terms of research subjects (e.g. agency, and structural, economic, and cultural contexts). Importantly, this exciting edited book reveals how desistance theory now appears ready to start developing alternative treatment methods, and to move beyond a mere desistance paradigm (e.g. regarding criminal records or probation sanctions policies). This integrated volume reveals how mature desistance research has become." Joanna Shapland is Edward Bramley Professor of Criminal Justice in the University of Sheffield and Director of the Centre for Criminological Research. She was awarded the Outstanding Achievement Award by the British Society of Criminology in 2013 and is Executive Editor of the International Review of Victimology. Stephen Farrall is Professor of Criminology in the Centre for Criminological Research at the University of Sheffield. Stephen also edits the International Series on Desistance and Rehabiliation (published by Routledge). Anthony Bottoms is Emeritus Wolfson Professor of Criminology in the University of Cambridge and Honorary Professor of Criminology in the University of Sheffield. He is also a Fellow of the British Academy. With Joanna Shapland, he co-directs the Sheffield Desistance Study.